It is hard for me to believe that Bunkycooks celebrated its third anniversary on November 23, 2012. Last year Mr. B prepared a video recap for the second anniversary of Bunkycooks (2011), so it seemed fitting that we reprise the blogaversary celebration with a 2012 edition. This year we have named the video Oh, the places you’ll go. After many days of creating, editing, formatting, and finalizing the video, I realized just how many places we had traveled to this past year, events we attended, and how many inspiring people we had the pleasure to meet and spend time with. 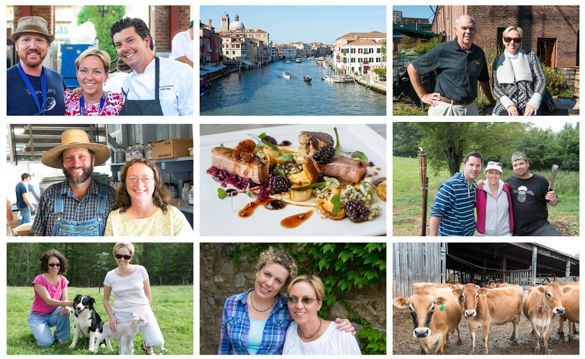 We have spent the last several years traveling to and writing about farmers, artisans, culinary destinations, and well-known chefs. These adventures have changed our life in more ways than I could explain. We have tried to share, in this space, the stories that we feel are important; whether it is the personal story of the Guenthers, a Mennonite family from the Muddy Pond community in the foothills of Tennessee who operate a sustainable farm and produce sorghum or the time honored method of smoking hams in Friuli, Italy and how the process is being challenged by the European Community. Needless to say, it has been a busy and fulfilling year. We have tried to capture the year’s highlights in this video with some entertaining music. I hope you will take the time to watch. You just might see yourself in one of the clips. The highlight of the year was in May when we traveled to New York City where Bunkycooks was a finalist in the James Beard Foundation Awards for Best Individual Blog 2012. It was truly an honor to be recognized by other food writers and industry professionals. While we were in town, I was also invited to meet Lidia Bastianich, which was one of my favorite interviews from this past year. On a personal note, the beginning of this year (mid-February) was a very difficult time for us as our dog, Beamer, became paralyzed from a rabies booster. We had to delay several trips as we spent many months taking care of Beamer and thankfully, he has almost fully recovered. In April, Mr. B and I celebrated our 10th wedding anniversary and just this month, Mr. B’s last CT scan (on his five year anniversary) was clear, so the eight years of our challenge with cancer has come to a happy end. To the people that we have met along this journey, thank you for sharing. Your passion, inspiration, and friendship are what has kept us going these past several years. It is not always easy to come home and put thoughts to paper, but I hope that we have conveyed the emotion and appropriately captured your stories as they were intended. So, with that, if you have not already, I hope you will take the time to watch the third year anniversary of Bunkycooks’ video. Many of the people we have met this past year are included in this video. * If you enjoy the music in the video, the songs are available for purchase on iTunes and Amazon.com. Gosh what an amazing journey it has been! Congratulations! Looking forward to the years to come! Thank you for your comment and yes, it has been an incredible journey. We are looking forward to what 2013 will bring and I hope to share it with my readers. Thank you and yes, we must make 2013 the year to meet again. Thankfully, the health issues are behind us and we look forward to another great year! year. Thank you for your friendship and for sharing Bunkycooks with us. Amazing videos, pictures, Gourmet cooking, The best of cooking! Thank you and yes, we have been blessed this past year. It was a lot of hard work, but the experiences have been unforgettable. I hope that 2013 will be another great year with interesting stories and great recipes to share. I can’t believe it’s only been three years! I keep thinking you’ve been around for much longer. Your blog is written and photographed with such expertise and zest and is such a joy to read! The video made me smile – it was perfect! Like Jamie said..what matters most is everyone being healthy and thriving..and your blog does continue to get better and better, although I think it’s been top notch from the ‘get-go’. Thank you so much for your kind words. It has been so much fun getting to know you over the last year. Yes, health is what’s most important and you certainly can’t do anything without that, so we are happy that much of the health issues are behind us. Here’s to a great year for all in 2013 and to meeting in person! So beautiful, fascinating, delicious in every way. I loved going along on this journey complete with music and maps and beaming faces and glorious salutes to food, cooks, farmers, friendship, love, culture, celebration, education, diversion…..the dirt, the grapes, the bottle, the glass, the wine. What a lucky one I am to have met y’all at IFBC in New Orleans in 2011and been blessed with your friendship since. To ten-time-ten more years of finding the stories and putting them forth with such briliance, wit, and beauty. Love being on the Bunkycooks journey. Please come back to NC and let me cook you some dinner for a change! Thank you so much for your comments. It was quite the year in 2012 and I am so happy that you were a part of our journey twice, even if it was brief both times. I will definitely take you up on the cooking offer, so we will have to make it to your part of North Carolina sometime soon. Here’s to another incredible journey in 2013! Fun video and love the music. What a fab year!